“All the ways of the LORD are loving and faithful,” (Psalm 25:10 NIV). I sat on the floor playing a card game with my young son. It was shaping up to be one of the best summers ever. Steven was savoring every minute of the long hot days, our Golden Retriever, Ginger, had delivered seven adorable puppies, and after years of negative pregnancy tests and doctor visits, I had a new life growing in my womb. In the middle of enjoying the moment with Steven, I felt a warm, sticky sensation that made my world stand still. A trip to the bathroom confirmed my greatest fear. Later that day, as I sat in the doctor’s office listening to his condolences for the loss of this much-prayed-for child, all I could think of was God, how could you? I drove home. Climbed into bed. Pulled the covers over my empty womb and my empty heart and cried. I was mad at God. If this is how You love me, then forget it. I gave God the silent treatment as if I could somehow pay Him back. God and I had a lover’s quarrel that summer. Actually, I was the only one arguing. I was mad. I was hurt. I felt betrayed by the One who was supposed to love me most. But He stayed right by my side, waiting, wooing, and eventually drawing my broken heart back so that He could heal it once again. His passionate pursuit and relentless romance continued. Even though I was mad at God, I knew in the deepest parts of me, that He did love me and that He was somehow going to use all this pain for good—but I sure didn’t like it. Ann Voskamp, in her book One Thousand Gifts, wrote: “I wonder…if the rent in the canvas of our life’s backdrop, the losses that puncture our world, our own emptiness, might actually become places to see. To see through to God.” This was a see-through place, but until I opened my eyes, I would not see God. Could it be that the puncture wounds in the canvas of your life—the losses, the disappointments, the crushing blows—might actually become the rent places of the soul through which you can see God? Through which you can peer beyond your earthly trappings into glory moments beyond? Through which you can see His light bursting through the openings? I believe they could be. How do we allow life’s difficulties to become see-through places? How do we begin to see moments of sudden glory burst through the puncture holes in the black backdrop of our greatest disappointments and pain? God, I’ll admit, sometimes I get mad at You. Sometimes I am disappointed. Please forgive me. I know You always have my best interests in mind. Even in tragedy I trust You. As David said in Psalm 25:10, “All the ways of the LORD are loving and faithful,” whether I understand them or not. Today is a toughie. What is one time you were disappointed in God? What lessons did you learn from the disappointment? How are you more like Jesus because that particular issue didn’t turn out like you thought it would? Sometimes the most glorious moments of seeing God occur on the dark backdrop of difficulty. If you long for something more in your relationship with God, it could be that He has a boatload of blessings to show you…if you’ll just open your eyes to see. Want to learn more? 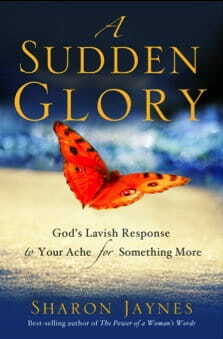 Check out my book A Sudden Glory: God’s Lavish Response to Your Ache for Something More.And if you’d like to learn more about how to use what you’ve gone through in the past to minister to others in your present, then check out Your Scars are Beautiful to God: Finding Peace and Purpose in the Hurts of Your Past.You’re not alone, girlfriend. God has an amazing plan!